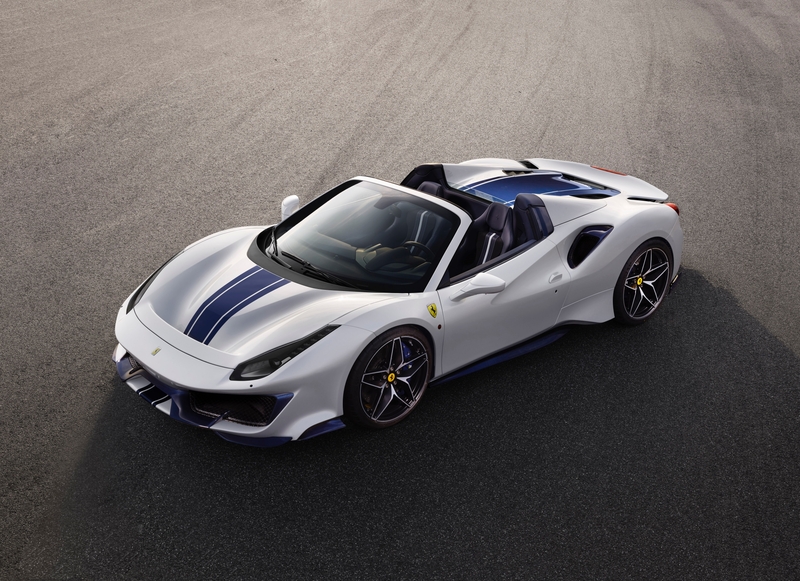 Ferrari has taken the wraps off the drop-top version of its recently launched 488 Pista. Aptly called the Ferrari 488 Pista Spider, it is the marque’s 50th convertible ever introduced. Everything else is essentially the same as the coupe, except the new Ferrari 488 Pista Spider is about 90kg heavier, taking into account its retractable metal roof. The overall dry weight? About 1,380kg — which is still pretty light. The new Ferrari 488 Pista Spider uses the same 3.9-litre twin-turbo V8 engine, producing a ridiculous 720bhp of peak power and 770Nm of max torque, enough to take the car from 0-100km/h in just 2.85 seconds. The new car isn’t released in the typical Ferrari red and dons a white coat instead, further swathed by a single bold-blue racing stripe that goes down its front. But perhaps the most notable changes added to its outer look are new 20-inch, diamond-finish wheels with a novelty 10-spoke, star-effect, which seems to be dividing the car community — some love the design, some akin it to cartoony flowers. There are also optional one-piece carbon fibre wheels that offer a 20-percent weight shed over the forged alloys that come standard with the car. Either way, the Italian luxury car maker says that the Spider is so closely aligned to the coupe, that it offers “the highest level yet of technological transfer from the track to a road-legal drop-top car”. Still, to make it feel like even more of a race car, Ferrari has generously used Alcantara and carbon fiber throughout the cabin, switched the floor carpets with aluminium plates and replaced the driver’s side door handle with just straps.